Large, deep, linear or just unique – our designer direct-vent fireplaces create the perfect look on scale that’s ideal for your perfect home. 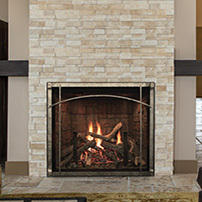 All of our designer models incorporate a clean-face design to allow you to finish right to fireplace opening to create the look of a site-built fireplace. Some also offer trim and decorative front accessories to tailor the fireplace to the room. With its massive log set, deep ember bed, dual burner and huge ceramic glass front, the Renegade is one great-looking fireplace, but what you can’t see makes this fireplace even more impressive. Empire’s TruFlame Technology ensures maximum flames and ember glow with minimum emissions. Our unique take on a traditional New England fireplace, the Forest Hills collection offers stacked logs on a dual-control burner set in tall opening. Frame your portrait with one of three available fronts in brushed nickel, black copper, and natural iron. Available liners in brick, stone, and black porcelain create a perfect backdrop. Simple and sleek, Loft contemporary fireplaces are a modern take on fireplace design. Available accessories include decorative glass, fronts, and more.